Roscommon Castle is in the West Region of Ireland. The first structure on the site was a fort built in 1269 by Robert de Uffort, Lord Justice of Ireland. The Lord Justice wanted to suppress the O'Conors, the descendants of the kings of Connacht, to extend English control in the west of Ireland. However, the fort was captured and destroyed by Hugh O'Conor and the native Irish before it was finished. A stronger fortress was built in the 1280s. The castle was built in a large quadrangle with corner towers and a gatehouse. A moat with a drawbridge surrounded the castle. Donogh O'Kelly, a local chief, attacked the castle in 1308 and killed most of the inhabitants. The ownership stayed with the Irish over the years. In 1341 the O'Conors captured it and kept control for many more years. In 1569 Sir Henry Sidney took control of the castle. The castle was made into a modern Elizabethan mansion in the late 1570s by Sir Nicholas Malby, the English governor of Connacht. Windows were added and gardens on the east side were enclosed by high walls. The castle was occupied by Confederate Catholics from 1645 to 1652 and was dismantled after surrendering to the Cromwellians. Roscommon Castle is located northwest of Roscommon town center, off the road to Castlerea. 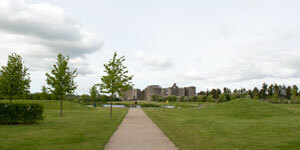 There is a beautiful park with walking trails adjacent to the castle. The castle remains are open to the public, but there is no access to the towers. 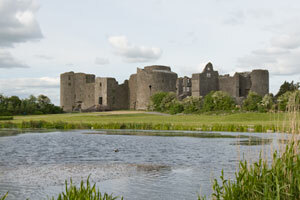 For more information about Roscommon Castle and the local area, go to the Roscommon website. Return to Ireland West Castles.